I’m sitting on the train on the way back to our home in Devon with a bag full of Christmas goodies, a flat white and a packed lunch and seeing as we plumped for the cheap train that takes an inordinate number of hours rather than the high speed insanely expensive service from Paddington, I thought it might be a good time to catch up on some Bike n’ Stuff posts. I’m still part way through writing up my recent trip to Australia (Sydney cycling write up here and video here) and have yet to tackle my time in the Snowy Mountains riding the Etape Australia but figured I should crack on with a few reviews in the meantime. First on my list? 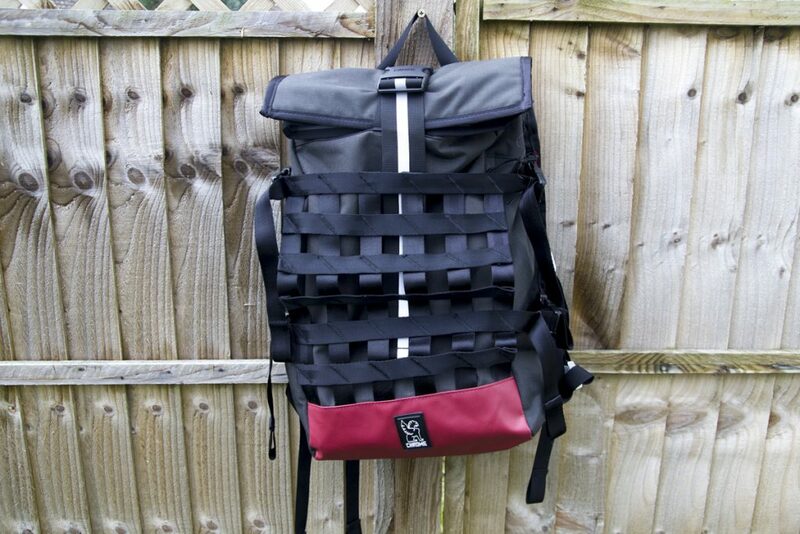 The Chrome Industries Barrage Cargo backpack from Santa Fixie, who are a European fixed gear and single speed online shop. Like with all their bags, Chrome offers a lifetime guarantee and as a result the Barrage Cargo looks and feels bombproof. 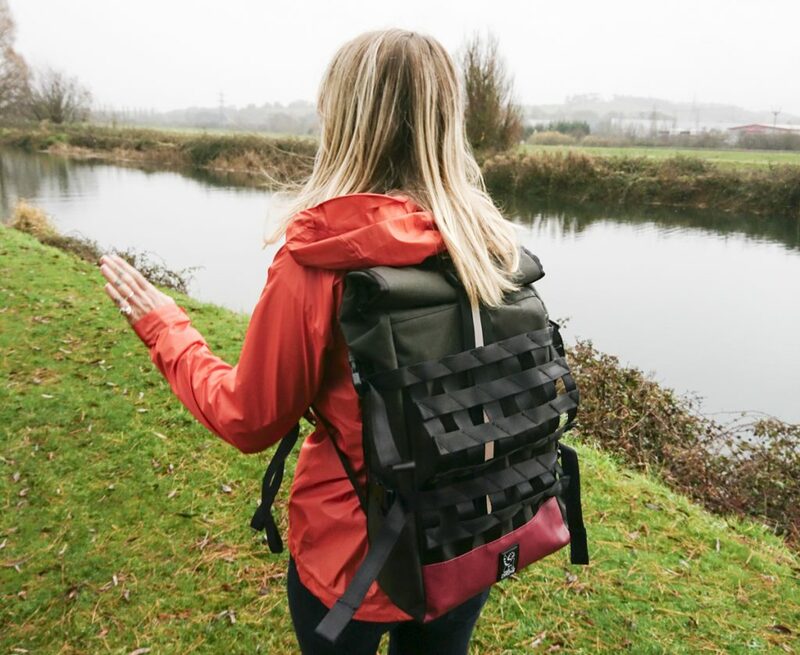 The first thing you notice about the backpack is how tough and durable it looks – clearly it’s a bag that’s made to last many years. The 1050-denier Cordura exterior is abrasion resistant so it’ll stay looking smart and not degrade with heavy use. I’ve been using it for several months now and it still looks like it’s fresh out of the packet. The fully welded and sealed military grade truck tarpaulin liner is totally waterproof and when I say that, I mean it won’t let ANY water in at all. As the bag is welded together rather than sewn, you don’t have perforations where a needle has punctured the fabric when stitching it together. It’s very comfortable to wear, even when fully loaded. The shoulder straps are ergonomically designed and the sternum strap helps takes weight off your shoulders and distribute it more evenly. A padded back stops your luggage jamming you in the spine or kidneys. Inside, you’ve got a 15inc laptop sleeve (non padded) at the back of one big pocket, then there’s a small zippered pocket on the exterior for items you need to access quickly. Being a bit of a neat freak, I didn’t like having to chuck everything in one giant pocket and would have preferred a couple more pockets either on the outside or inside. Then there’s the issue of the exterior pocket’s vertical zip, which makes me worry stuff will drop out when I open it. I’d have preferred a regular horizontal pocket for keys and my purse, as it’s more secure. There’s also a side pouch, which fits a water bottle (or small lock perhaps). One of my favourite features is the cargo net at the front, which fits a helmet perfectly. I nearly always have a helmet with my wherever I go and previously I’d have to just dangle it off my where it would clonk people as I walked through the carriage of the train or swing round and bash me in the face, so it’s nice to have it neatly stowed. 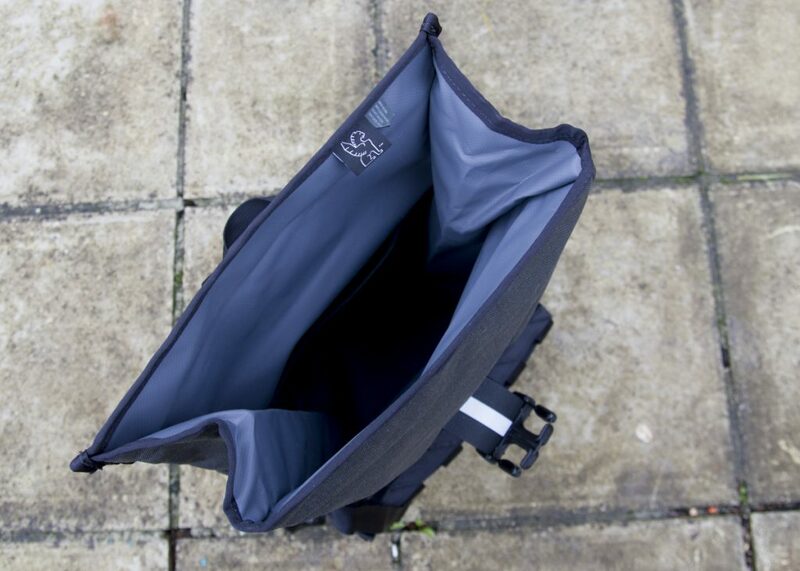 Closure is with a roll top and adjustable buckle, so you can stuff a few extra bits and pieces on top of your load and extend the capacity of the bag. 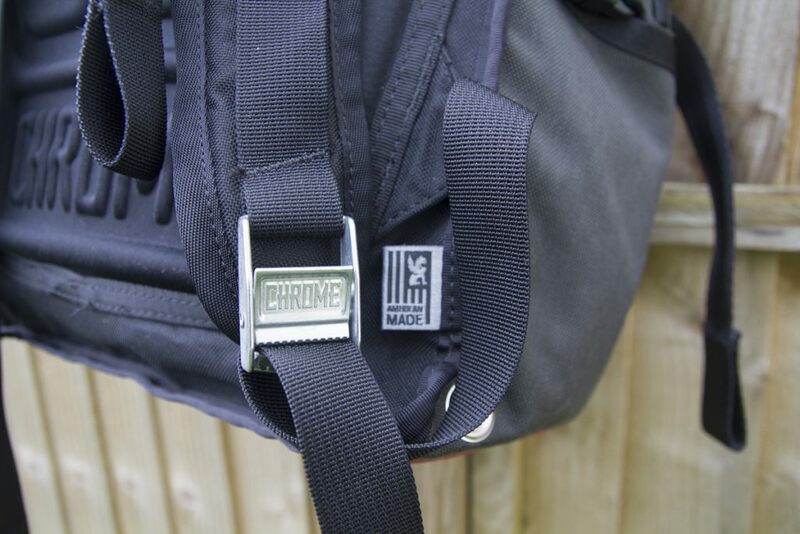 There are also side compression straps should you wish to cinch the bag in and make it smaller. The strap has a reflective strip to increase visibility at night. When it comes to volume, the indicated size is 22 – 34 litres, which means nothing to me, as I can’t properly visualise that. In practical terms, it means you can fit in a large shoebox with some extra space on top of it (rather than around it). The bag is on the moderate size so would be suited to commuting or going to the track, rather than say, travelling with all your gear for a holiday. As the bag is kind of rigid, it stands up on its on which is pretty neat – it means you don’t have to lie your bag down when you’re standing around and as only get the very bottom of the bag in contact with the floor the bag (and your t-shirt) stays clean. 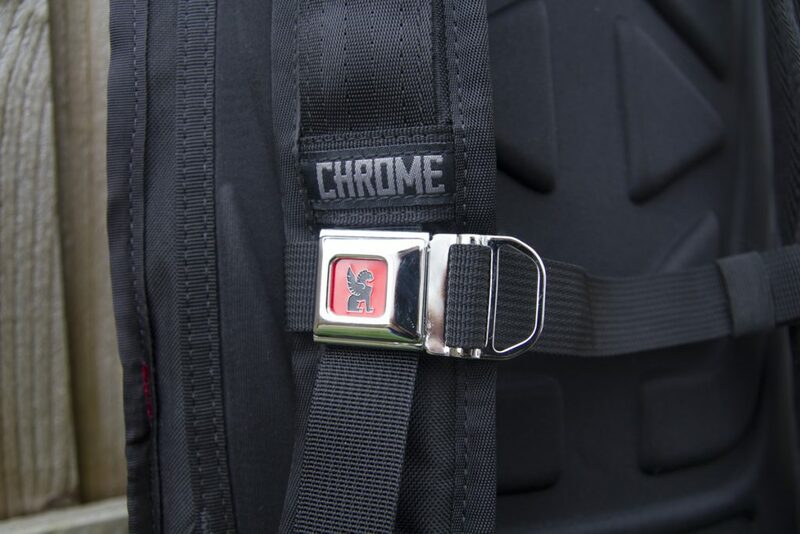 When it comes to weight, well, it’s far from light – the durability and shiny Chrome signature seatbelt buckle come at a price. 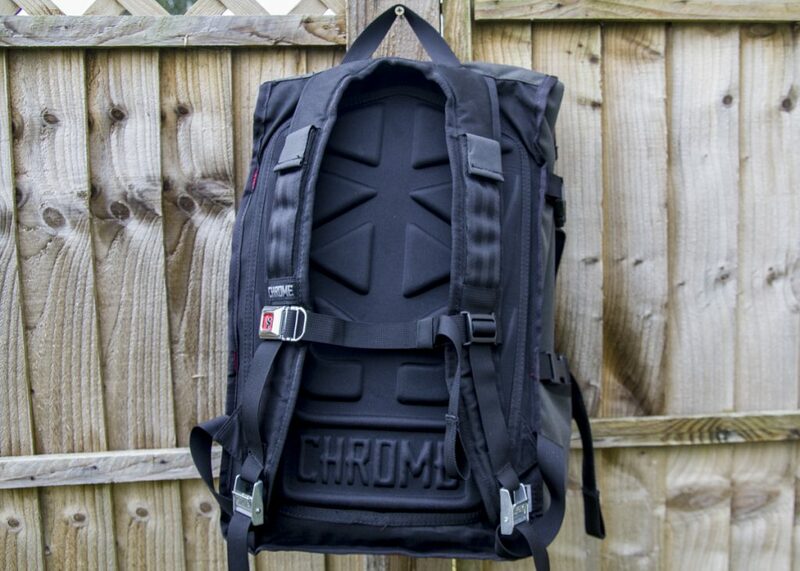 If you don’t mind that, then Chrome Industries Barrage Cargo bag would make a solid choice if you were looking for a stylish, tough, fully waterproof cycling specific backpack that’ll last a lifetime. I’ve been using a Barrage for nearly two years now and its as good as new. The cargo net is really useful, not just for a helmet but also for extra stuff like boxes, etc. Yeah, it’s a nice touch as it just makes the bag that little bit more versatile.